It’s one thing to know where a good breakfast is, it’s another to find where the most legendary pancakes are. 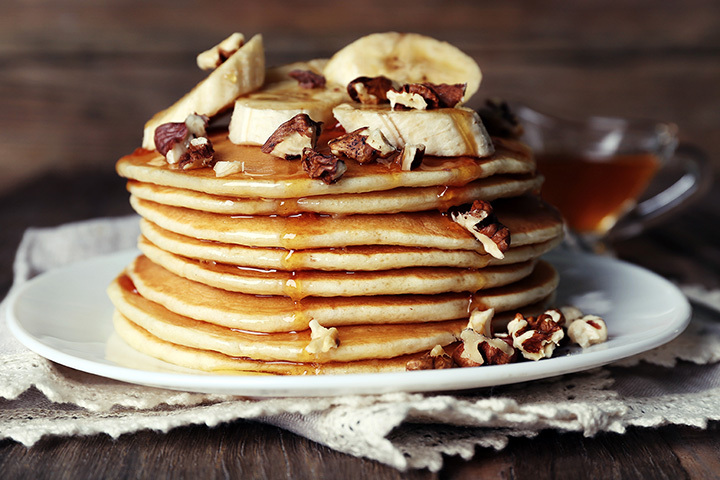 Whether you’re craving a blueberry or chocolate chip variety or you’d like something topped with whipped cream, there’s a delicious flapjack waiting for you at these 10 awesome places for pancakes in Michigan. Breakfast in Three Rivers starts off at the Oasis, a spot that shows just what kind of impact a good breakfast can have, even at night. The basic pancake selection starts off with a stack of four, and from there adds strawberry, blueberry, cinnamon apple, and cherry to the options. Good by itself, but when you throw in the fact that they're served as a side with most other breakfast options, you've got the perfect place for pancakes in Three Rivers. Portage’s Cafe Meli—Greek for “honey”—is a stand-out among stand-outs in Portage breakfast. Cafe Meli takes it to some exciting new levels. Standard pancakes are on hand, of course, as well as blueberry and chocolate chip pancakes. Try a short stack or the silver dollar pancakes. But then they get really interesting—how about pancakes made of potato, served with sour cream and apple sauce? How about a ham and egg sandwich with pancakes for bread? That's Cafe Meli, and that's a killer pancake. Linwood Corners in Linwood is something of a celebrity. They took top honors for pancakes in the Tri-Cities from WNEM Channel 5, so that's definitely a point in their favor. They're served in the full stack or half stack, and with or without meat. It’s simple and classic here at Linwood. At the Pantry, the apple pancake is the star. The apple pancake starts with German pancake batter and oven-bakes it rather than griddle-fries it, then couples the result with sautéed apple and a cinnamon glaze. That's just the start of what the Pantry can do for pancakes, though, as buttermilk, sweet potato, and several others make an appearance. The other recommendation from WNEM Channel 5, except this time for Genesee County, Flint's Telly's Coney Island took top honors here. With strawberry, apple, and blueberry on hand, there’s a good variety afoot at Telly's. Hit Detroit proper up for a stop at the Hudson Cafe, home to pancakes that will really blow you away. We’re talking about the red velvet pancake, a pancake which starts with red velvet cake batter, then is prepared as normal before being frosted with a cream cheese icing and dusted with cocoa powder. If that's not crazy enough for you, check out the Oreo, Cinnabunn, and Chunky Monkey varieties to show you what a pancake can really do. Sophia's House of Pancakes in Grand Ledge makes it clear that it's not affiliated with any other Sophia's restaurant, but it's got a way with pancakes all its own. Start out with a regular or short stack of buttermilk pancakes—four or three, respectively—or a dozen silver dollar minis. Try them in apple cinnamon, banana nut, blueberry or chocolate chip flavors. Consider adding a topping, from banana to walnuts. Think about adding a scoop of French vanilla bean ice cream. If you're already a little burned out on the options, you may want to take a breath before considering the rest of the menu, because that's just what they do for pancakes. While hitting Muskegon, stop in to Mr. B's Pancake House, a pancake operation that's been going on since 1974. Mr. B's notes that “we stick to what we're good at,” and what they're good at is clearly pancakes. Featuring all-day breakfast, every day, you'll be able to get 15 different kinds of pancakes here. From the basic buttermilk to some more unusual options like oatmeal, oatmeal with blueberries and bananas, or peanut butter and bacon pancakes—and even gluten free—you'll find exactly the pancake you need at Mr. B's. Spoon University swears the pancakes at the Laundry in Fenton are the best Michigan can offer, and while we can debate forever, the Laundry certainly has novelty on its side. While strawberries and cream and the Fat Elvis—peanut butter and banana with maple syrup—certainly are worth note, it's “Bacon n' Brie” that steals the show here. Pancakes with the namesake elements, served with apple-cinnamon compote and the ubiquitous maple syrup, make for a combination you may not find anywhere else. With a name like the Pancake Chef, this Mackinaw City staple since 1964 had sure better deliver on the pancakes. When we heard they had pumpkin pancakes, well, we knew that was something to pay attention to. The Pancake Chef turns to many of Michigan's greatest fruits for inspiration—check out the apple and cherry versions—but won't leave others out. Georgia pecans, chocolate chips, and even peanut butter step in, and that's before we talk about the homemade potato pancakes with sour cream or applesauce.